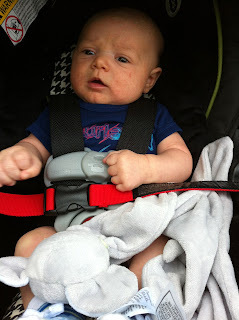 This morning Mason and I headed out for our jog earlier than yesterday to beat the Charlotte heat. We started around 9:30a while it was still cool out (relatively speaking). Oh and by the way, it has not gotten any easier to push and run with this thing ... it's quite the upper body work out. My goal of jogging 5 miles by the end of May with Mason seems to be unattainable at this point. I'll be lucky if I can hit the 4 mile mark. One of the highlights of running with Mason was that he would take a super long nap while in his car seat (attached to the jogging stroller). Immediately after I stopped running today Mason's eyes were wide open. He was no longer interested in napping in his car seat if I wasn't going to keep on running. Sigh. Maybe I will increase my mileage/time only to give myself a little more quiet time from Monster Mason. Day #5 of my work out streak!